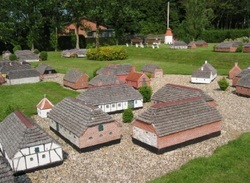 Daugbjerg miniature village is an exact replica in size 1: 10 of Daugbjerg, as it looked before the great fire in 1791. The construction of the miniature village was initiated in 1994 and in 2007 it stood complete with 150 buildings divided by 20 farmhouses, 10 cottages, schools, water mill,Church and the "Kongelige Kalkbrænderi". It is to our knowledge the only miniature village in Denmark who have already been completed. Daugbjerg miniature village is situated on a beautiful site right next to the millpond, which was reestablished in 1990. In addition to miniature village is cafe, banquet hall and handcraft shop establish in the barn to the old watermill .